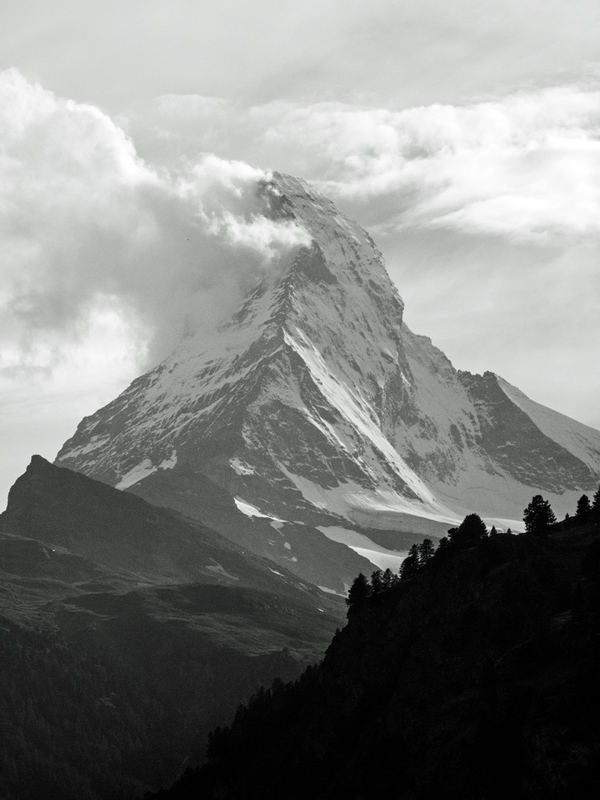 Next year – 2015 – is the 150th anniversary of the first ascent of the Matterhorn. Zermatt is already publicizing this special anniversary, and the preparations include a grand re-opening of a refurbished Hörnli Hut that is situated at the foot of the Hörnli ridge – the most popular and easiest route of ascent. The hut is closed all this summer. So what do you do, if a critical hut is out of use? You think creatively and come up with an innovative solution. The solution is Base Camp Matterhorn. Click here to read an information sheet about this solution that is described as an Alpine ‘Pop-Up’ hotel. And you can probably guess where I have been today. I took the Cable car to Schwarzsee and then an hour’s walk took me up to Hirli to view the Base Camp. Hirli is about an hour short of the Hörnli Hut, so climbers attempting the mountain this summer will have an extra hour added to their ascent time. If you take a look at my latest image of the Matterhorn (click here) and note the prominent prow of rock that juts out almost to the left margin of the image – that is Hirli. The Hörnli Hut is situated on the top of the rounded dark hump to the right of that promontory that almost appears to merge into the mountain itself. The last section of the climb to Hirli is steep with a couple of sections on metal gangways. At the top of the ridge the first sight you will see is a pyramid with 4478 on it. Why 4478? Answer – because that is the height of the Matterhorn in metres (14,692ft). A little further and you come to an extraordinary array of objects in the shape of old ridge tents. They remind me too of the Seracs I saw in the Himalayas balanced on a rock strewn glacier. They are other-worldly: a concept made stronger by the fact that they are sited on totally barren ground that could be lunar. Each small shelter is a two-person sleeping pod. There are larger versions that serve as Reception, Kitchen and the Mess Tent. I spent well over half an hour here, trying to find the best vantage point from which to shoot and also waiting (in vain as it turned out) for the Matterhorn to shrug off its cloak of cloud. This ‘Camp’ will remain here until the end of the climbing season and will then be removed. I’m wondering whether to return next summer to be here for the anniversary itself: 14 July. It’s a tempting idea, particularly as I reminded myself a few weeks ago while reading through some old family diaries that by a fluke of circumstance I climbed this mountain in its centenary year. This entry was posted in Climb and Trek, Swiss Alps - Summer and tagged 150th anniversary of first ascent Matterhorn, Base Camp Matterhorn, Hirli, Hornli Hut, Matterhorn, Photography, Valais Alps, Zermatt. Bookmark the permalink. Both this entry and yesterday’s are completely entrancing. Of course I’ve heard of the Matterhorn, and no doubt have seen photos of it, but I don’t remember them. I don’t think I’ll forget these! To get to the camp you show here, is that simply a good, hard hike, rather than actual mountain climbing? I’m thinking it must be. But what a hike! Thanks for the glimpse of this wonderful mountain (and its friends). Thanks Linda. It’s a steep hike, a narrow rocky path in places and two iron gangways one including a short staircase. No climbing, hands not required, just a steady head. The highest points always involve the greater work but the rewards are worth the effort. Great post Andy and awesome images. Thanks Edith – I hesitate to use the word ‘unique’ but in my experience this was something totally different from anything seen in the mountains and it will be gone in two months.